As you read this we could be in the middle of a drought or heatwave, or we could have just had two month’s worth of rain in approximately four minutes – this complete unpredictability of climate is one of the things that make this Emerald Isle so attractive to folks who have two seasons back home – summer’n ‘winter, wet or dry, hot or cold. It’s also one of the things that drives the natives nuts. I think it’s one of the reasons the Irish are famous for being so friendly – conversation is never, ever a problem, whether we know you or not. “Desperate isn’t it! For July, like! It’s ridiculous!” “Isn’t it beauuutiful out thank God! Sure we’re long overdue a bit of sunshine…” Maybe this slight edge of madness and obsession makes us more interesting to tourists, or is that wishful thinking? Anyway. I do want to talk to you aboutwater, because if you have a garden, you need to know how and when to apply the H20, and how much of it. If your garden is established, then anything growing in the ground should be able to fend for itself unless we have several weeks of drought, which is rare, but it does happen. Plants in containers of course are another matter, as they can’t send their roots outwards to seek water, so they need checking on a daily basis. If the compost is damp, like a wet flannel, keep it that way, and if it’s drier, give them a good soak. If you have a newly planted area, you really need to keep a close eye on it for at least the first year, and if the soil shows any signs of drying out, take action. 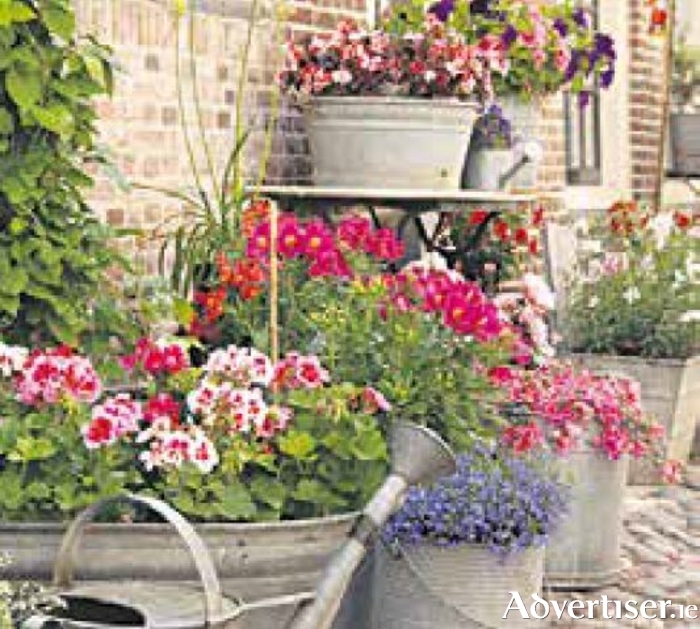 Soak the soil around the plants thoroughly rather than the leaves themselves, which can just lead to other problems. It’s much better to give plants a really good drink once or twice a week, rather than a daily light sprinkling. This is because by watering thoroughly, the roots are encouraged to head downwards to where the water is, leading to a stronger plant. By just wetting the surface of the soil, the roots are encouraged upwards instead and your plant won’t be as healthy and resilient. A thorough downpour will soak the soil for you, but the gentle misty rain of “a grand soft day” is really only good for fraying tempers and spoiling picnics. Even in heavy rain though, the canopy of leaves can often shelter the ground underneath leaving it very dry, so that’s something to watch out for. When you’ve given the garden a good drink, reward yourself with one too for a job well done. And now, being a sucker for punishment, I’m off to check the weather forecast…….. Page generated in 0.0560 seconds.